Stuart Staniford has been watching the decline in oil prices. He has then commented that, given the Saudi need for income to hold off “Arab Spring” dissatisfaction, they are unlikely to let prices fall too far, before cutting production, since even a 10% reduction in output could raise prices 20%, thereby resolving possible income concerns. This well reflects the role of the Texas Railroad Commission back when, which controlled US production in order to sustain an acceptable price for oil. 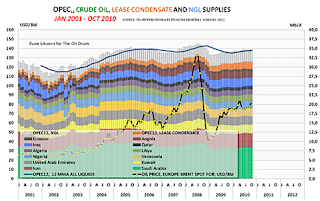 But that role collapsed when overall US production was no longer able to spring to the rescue when demand rose, and US production could not, passing the control over prices to OPEC and more particularly the Kingdom of Saudi Arabia (KSA) who could, and have shown a willingness to, control output to ensure that it proximately followed demand and has kept prices within an acceptable range, for them. It is easier to do this by curtailing production, and as Stuart noted, this can increase KSA revenue at a time of falling global demand. However, in the opposing case, where the global economy requires a “reasonable” price for oil, and will require them to increase production, as they have done to the limits of demand growth in the past year, that ability may be limited and of a shorter duration. 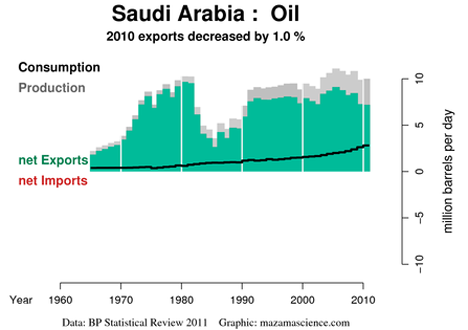 It also occurs at a time that the internal use of crude is limiting the amount that the KSA can export. 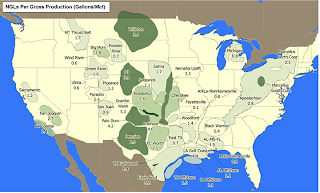 But while there is considerable discussion about this situation, there has been some increase in natural gas liquid production that is also important, and thus a main point of this post. In the past, when the Kingdom has been challenged on the ability to increase production, it has listed the number of future fields that it would bring on line. Previous lists of future projects are, however, now reaching completion. Shaybah, for example, in the Empty Quarter, raised production in January 2009, from 500 kbd to 750 kbd, and will soon raise it an additional 250 kbd to 1 million barrels a day. The increased production at Shaybah, however, also helps identify an additional source of increased production, since is also increasing natural gas production to 2.4 bcf/day, with a concomitant production of 264 kbd of NGL. The increase in overall production of NGL from OPEC has, for some time, provided a significant volume of additional fuel. By the last quarter of 2011 OPEC as a whole was producing 5.42 mbd of NGL and NCF (non-conventional fuel), (up from 3.89 mbd in 2006) Rune has written about NGL production here and here with the relative importance of this supply perhaps best illustrated with this graph from the latter post. OPEC is anticipating an overall increase in NGL production from the 2011 average of 5.3 mbd to 5.7 mbd in 2012, with final quarter 2012 volume reaching 5.86 mbd. Apart from the increased supply from Shaybah, KSA is developing the Arabiyah/Hasbah offshore fields with onshore processing at Wasit. This will produce 2.5 bcf/d of natural gas, with 240 kbd of NGL production associated with that. There is also the development of the Karan field that will, with the other programs in development, collectively raise KSA natural gas production to 15.5 bcf/day from the 10.2 bcf/d it was achieving in 2010. Unfortunately the high sulfur content of the gas to be fed to Wasit is causing some problems and that project completion may now be delayed until 2015, though the problem (of sulfur freezing in the lines) is not yet solved. 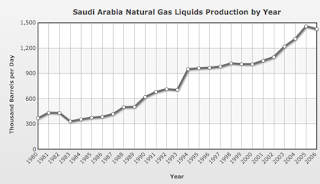 Saudi production of NGL’s has steadily grown over the years. Last August, for example, it shipped 197,824 metric tons roughly equivalent to 66 kbd, of exports through ports under the Saudi Port Authority – note that this does not include the amount used internally, but was 79% up on the previous year and does not include shipments from ports operated by Saudi Arabian Oil Co, or by Aramco. 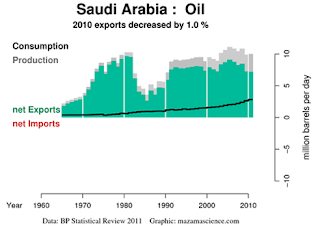 It should be also be noted that, following the drop in consumption caused by the recession, the United States has increased the amount of crude that it is importing from KSA over the last couple of years. However, because of the increase in the volume of natural gas produced in the United States, there has been a concomitant rise in the amount of NGL produced. The volume of NGL produced varies with the field, with the relative differences shown in the following figure. In 2010 the US averaged a production of 2.42 mbd of NGL, and were production of natural gas to rise to 110 Bcf/day by 2035 as has been projected by some, this will, at that time yield some 3.9 mbd of NGL with an additional 0.69 mbd from refinery production. The US does not, sensibly, import any NGL, and with rising production will likely start exporting to Canada, where production is declining. The Saudi market for NGL lies largely in Asia, with an export terminal at Yanbu The terminal is connected to Abqaiq through a 1,170 km pipeline, and can handle exports of up to 2 mbd of NGL.